Jésus et Israël was the first sustained, wide-ranging, well-grounded and passionately argued intellectual assault upon anti-Judaism in history. The adversus judeos tradition “is not easy to find… in the Church’s official documents,” according to Gregory Baum, who had a hand in the drafting of Nostra aetate (No. 4). 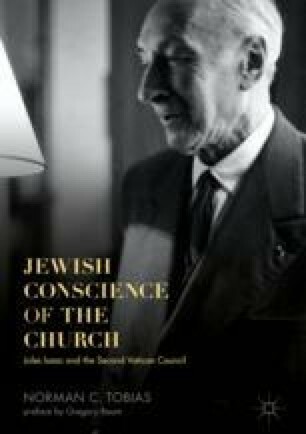 “Since [this tradition] was not a contested teaching, there was no need for the official Church to deal with it.” The contemptuous teaching about Jews may not be easy to find in the Church’s official documents, but what about its corollary, the system of degradation, as concretized in the Jewish badge, the destruction of Jewish religious books, Jewish segregation in compulsory ghettos and conversional sermons? These measures were papal-decreed, at successive councils, with a view to protecting Christians from Jewish influence and converting the Jews, or at least humiliating them, as a deicide race. Anti-Judaism was an ancient tradition, consisting of a seemingly unbreachable complex of interlocking and mutually reinforcing ideas. This complex was akin to a system in the structuralist sense; it subsisted by its own law, preserved or enriched by the combination of its transformations and without need to reach beyond its confines or appeal to external elements. For example, if there is no collective Jewish guilt for the death of Jesus; if, to the contrary, the Jewish people as a whole then living did not reject Jesus, does it follow that Jesus posed no challenge to the Judaism of his time, that he was nothing more than one in a line of failed (as opposed to false) messiahs? The theological slope is a slippery one. The challenge was not the replacement of one idea by another, but of an entire structure of ideas by another, with attention throughout to questions of history and exegesis.